I started to build on my Boardman and McMurray/Jackson family lines on my mother’s side and I posted my findings on the Boardman and Brown blog I write. I also did some searching on the Spracklins. Spracklin is Amarilla’s maiden name. So I studied the records for Somerset, Dorset and more in England. I will be sharing those findings on my other blog: Solomon Goss of Fearing Twp. in future posts. See the right panel of this blog for the links to my other family history blogs. 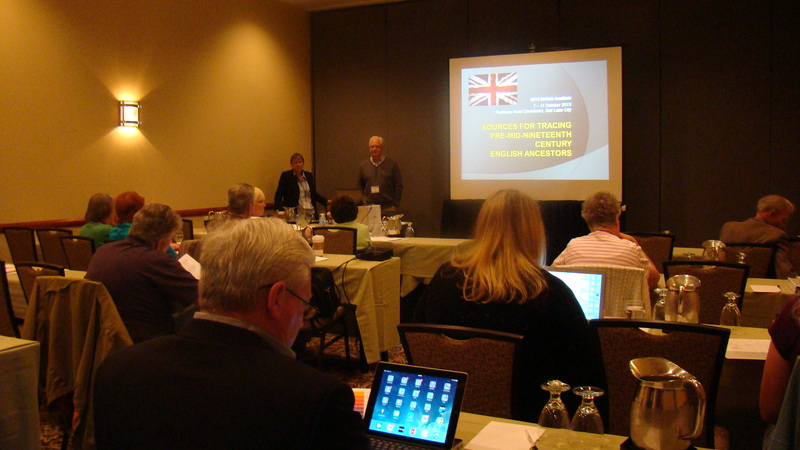 This year in 2014, I will be attending the Institute again in Salt Lake City and taking Scottish Research: The Fundamentals and Beyond, by Paul Milner. 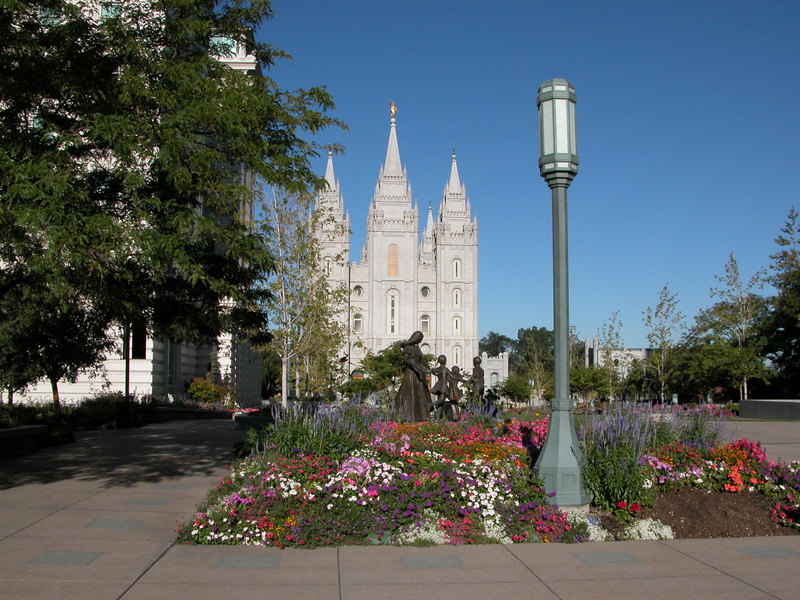 So I am currently in the process of preparing to attend this course and getting ready for the trip to Salt Lake City. 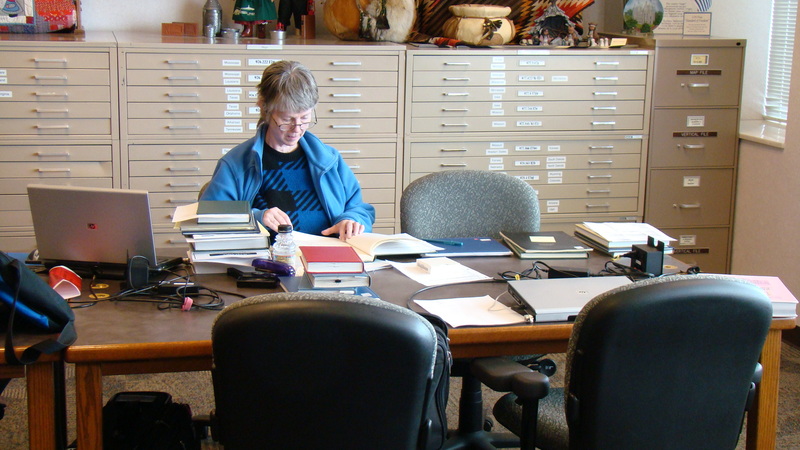 I also plan to take advantage of the opportunity to do more of the family research at the Family History Library. It will be a very intense week of classes and researching. So I will be getting back to posting on this blog some time in November 2014. There is a lot of good information coming for future posts on the Barclays. This course hopefully will help me to learn about Scottish genealogical research, figure out a strategy to “Finding the Greats.” Hopefully I can find John Barclay and Margaret my great great grandparents in Scotland. These are George A. Barclay’s parents, the subject of this blog. 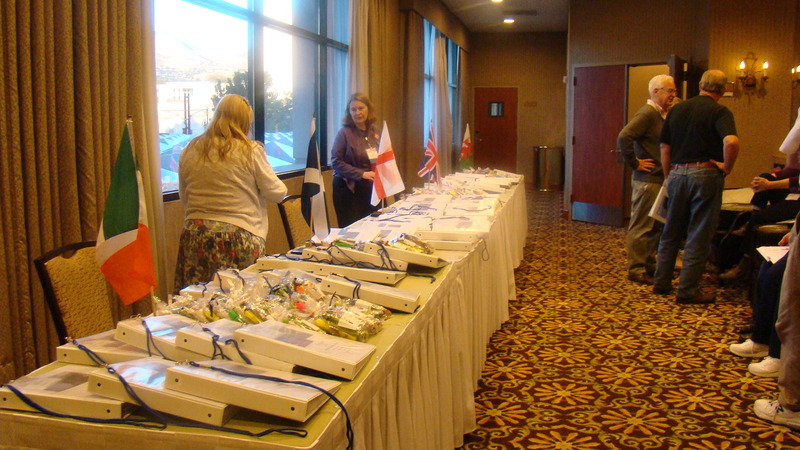 I want to visit the British Isles at some point within the next two years so I am getting ready. 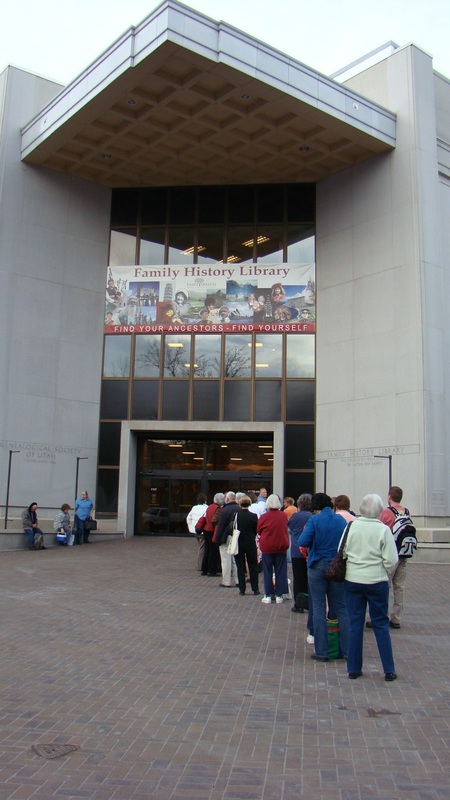 This will be my sixth trip to Salt Lake City and the Family History Library. 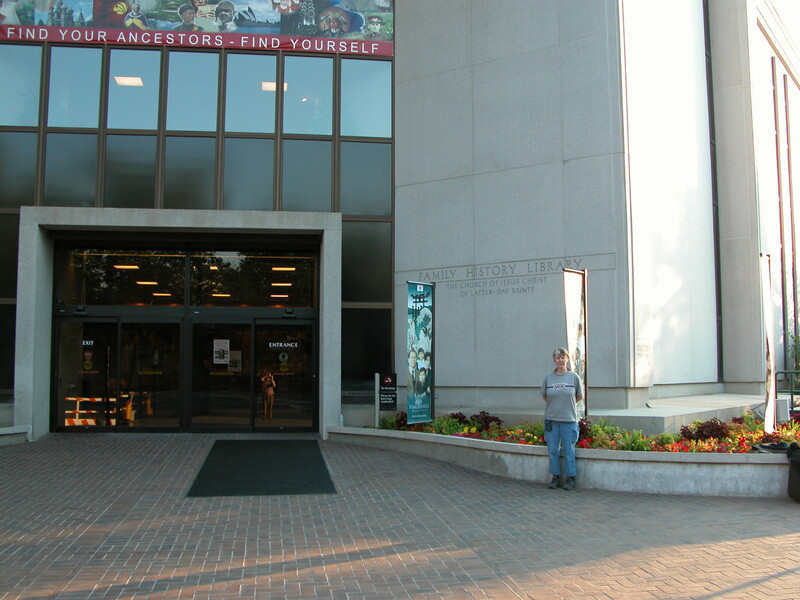 https://familysearch.org/locations/saltlakecity-library This library and their online website for their records has contributed greatly to my research successes. https://familysearch.org/search I do know of people who go there even more than six times. At the National Genealogical Society Conference held in Salt Lake City in 2010 Family Search announced that they would digitize their whole collection and it would take 100 years but they had created ways to improve digital transfer so they could do it in 10 years. I was amazed. Every time I go to their website it changes and gets better and better. 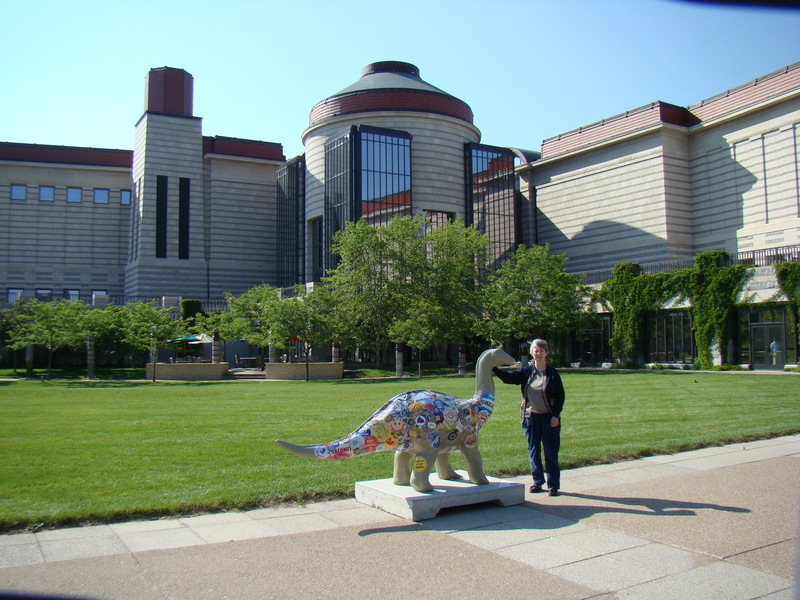 I was thinking of sharing my Powerpoint lecture: “Planning a Trip to the Family History Library,” on this blog but I created it five years ago and it is now very out-of-date, so you can see that Family History Library and their website have changed a lot. 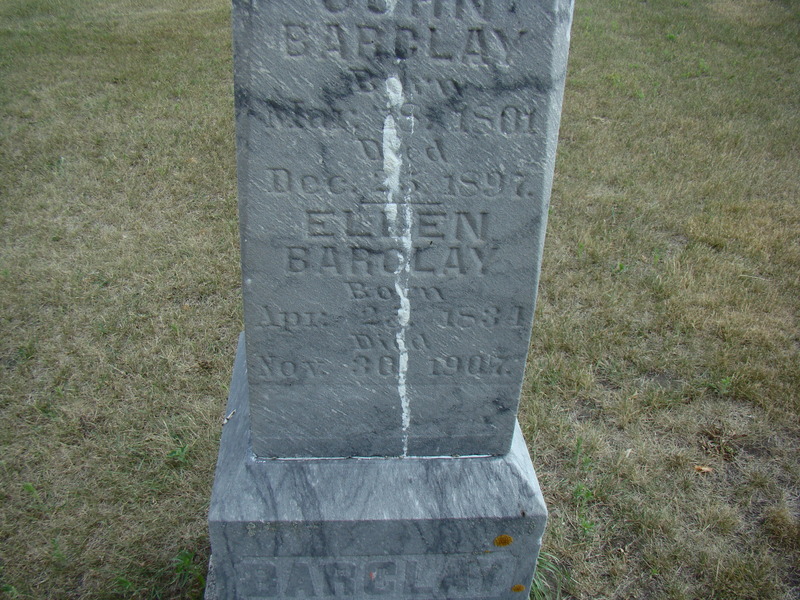 John and Ellen Barclay are both buried in Valley Cemetery in Shakopee, Scott County, Minnesota. 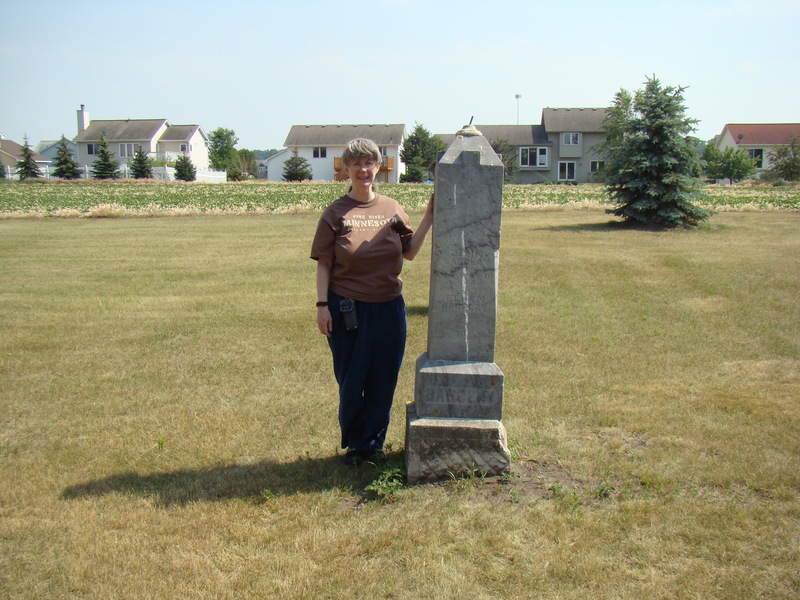 Finding Valley Cemetery was not an easy task for I did this back in 2007. 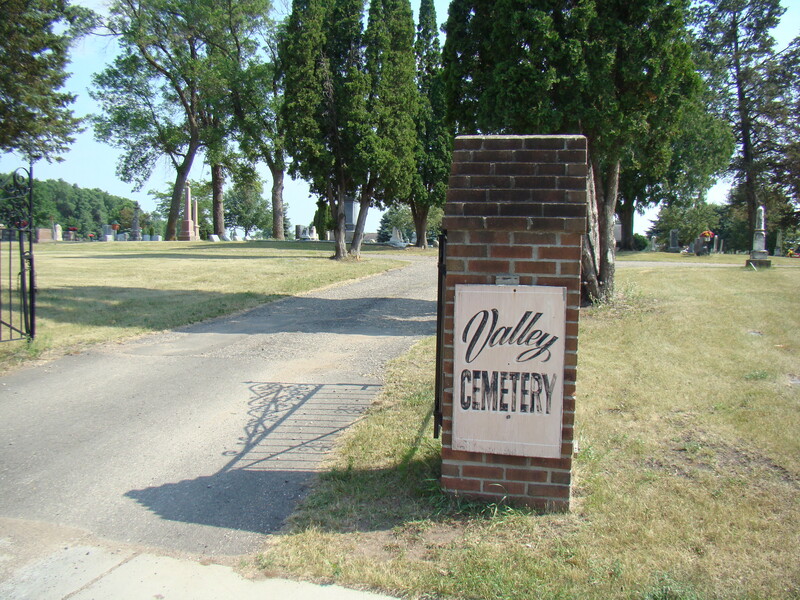 Find A Grave has a listing of Valley Cemetery about 82% photographed, along with a map of the location. 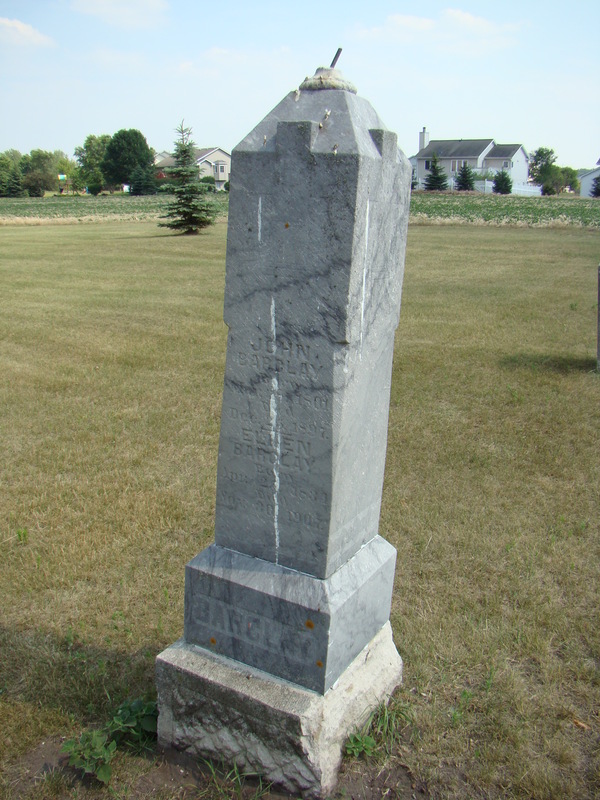 There is a picture of the tombstone of John and Ellen taken in 2010 and it is looking a little worse for wear. My photos were taken in 2007. When my husband and I arrived at the cemetery in June of 2007, we went to the location given in the cemetery publication I had found. I searched and searched but did not find the tombstone. Luckily my husband is very good at finding things in cemeteries. He found the stone in a different location. We first looked at lot E 1/2 lot 94. 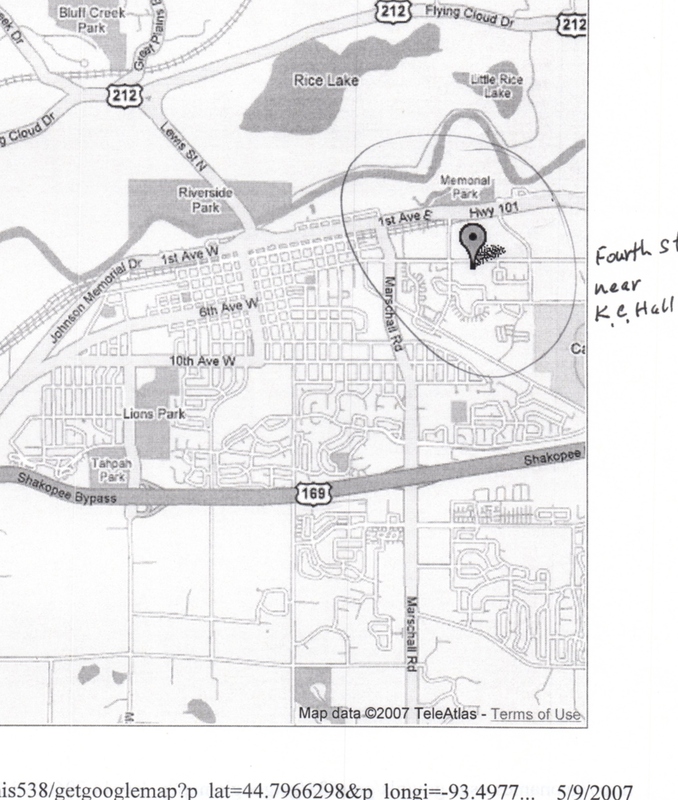 See the white arrow on the map below. Instead, the tombstone was in the South end section 7 Row 16 near a Sam Woods, Ronald Brown etc. 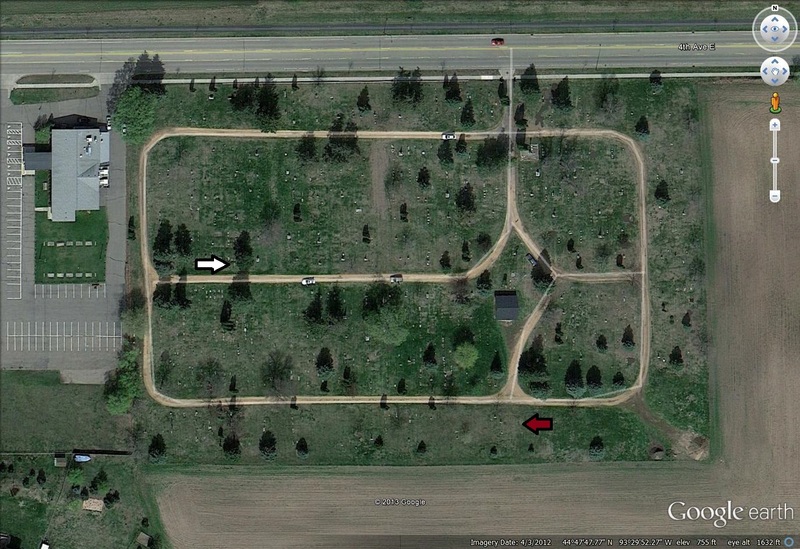 It is closer to the cemetery shed and farther from the house on the left. See the red arrow. Go in at the entrance sign and go straight back past the shed. Here is the tombstone that I saw in June of 2007. It had lost its finial at the top but it was not leaning like the Find A Grave photo. Here are closer views of the inscription on the tombstone. It reads: John Barclay born Mar 18, 1801, Died Dec 25, 1897. Ellen Barclay born April 25, 1831, Died Nov. 30, 1907. The next photograph is closer to Ellen’s information. The name of John’s second wife has been a lot of trouble. Here it is written as Ellen, but her estate file has it as Helen, sigh! We can go with the information on the tombstone or keep an open mind about other records that use Helen. I took this picture so that one could use the houses in the background to find the tombstone quickly. Here is a picture of me next to the tombstone of my 2nd great-grandfather John Barclay. Ellen was his second wife and I descend from the first whose name was Margaret. Little is known about Margaret unfortunately. John Barclay December 1897, George’s Father succumbs! George’s father, John Barclay, passed away on 25 December, 1897. I tried to find out if George attended the funeral but I did not have any luck with the newspaper gossip columns in Pine River and in Shakopee. He is barely mentioned in the obituary. 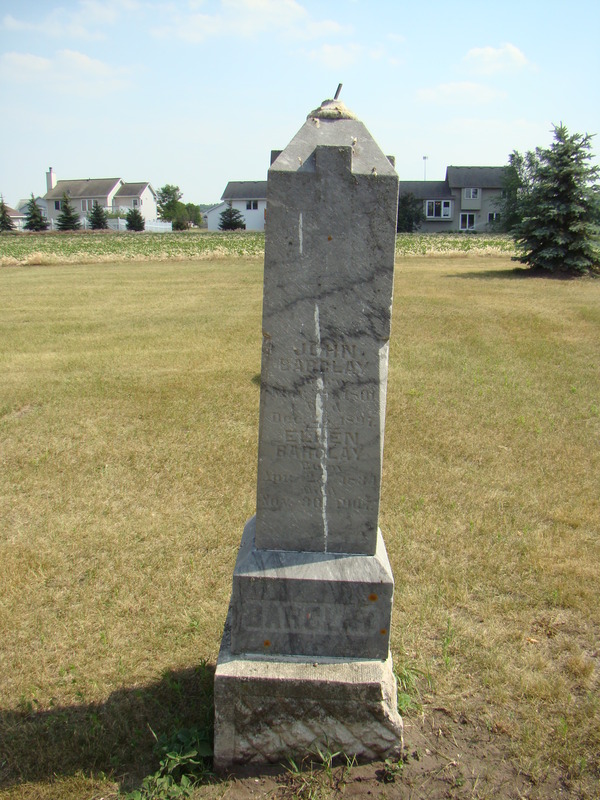 The last time I posted on my 2nd great-grandfather John Barclay, I talked about his Civil War service in several posts and caught up with the happenings in Eagle Creek, Scott County, Minnesota. There are many more posts on John Barclay that were done early in this blog so check on the Categories on the right side. These were the most recent. 3. Rejected Claim: John Barclay’s Civil War Pension!, dated March 11, 2012. In 1894, John and his wife Ellen/Helen, sell land to a Charles G. Bowish of Shakopee, Minnesota. They receive $1 from this person which might imply some relationship? For the sum of $1.00 convey the following land: The north half of the NE qtr of Section 23 in township 115 of range 22. Except a mortgage thereon and on their lands, payable to Henry Hinds. Witnessed by Charles G. Hinds and E. J. [Affolter] and signed by John Barclay and Helen Barclay etc. 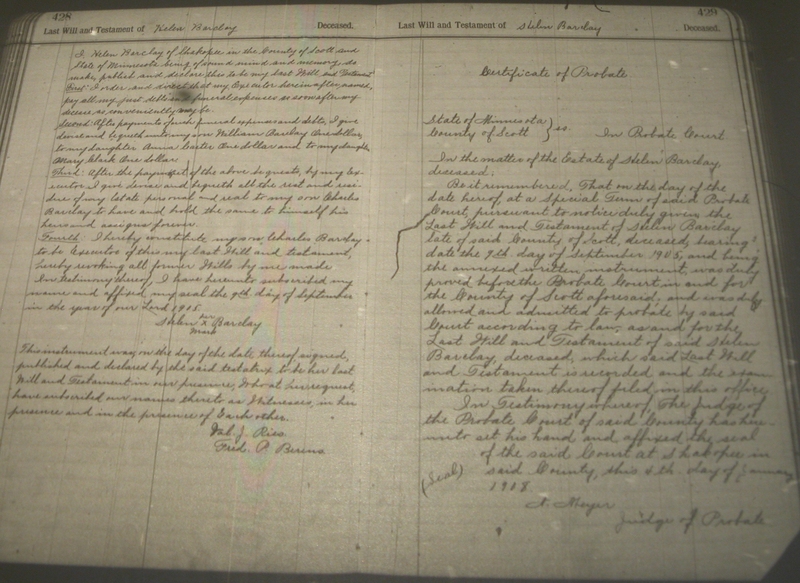 Source: John Barclay & Wife to Charles G. Bowdish of Shakopee City, Minnesota, 21 June 1894, Vol. 39 pg. 227 Instrument #1304, Scott Co., Minnesota FHL#1255725. Source: Family of John Barclay, 1895 Minnesota State Census, Eagle Creek, Scott County, Minnesota, pg. 2, Schedule #5, Enumerated on the 10th day of June 1895. FHL#565810. In 1898 the Every Name Index to the Scott Co. Atlas of 1898 has Barclay listed and we find Helen Barclay and William Barclay are the owners of the land. 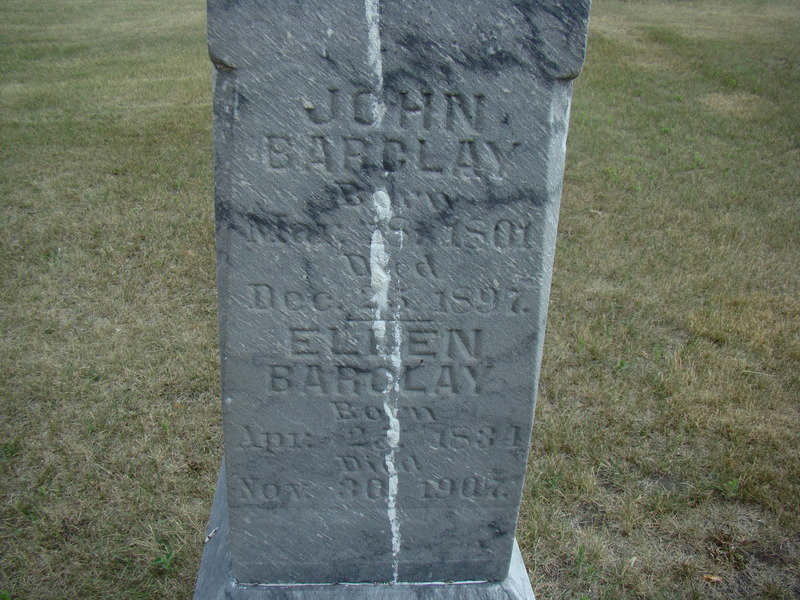 John Barclay appears in the Vital Record and Indexes of 1853-1972 for Scott County, Minnesota – Death Records. Vols. A-C 1871-1907, FHL#1379418. 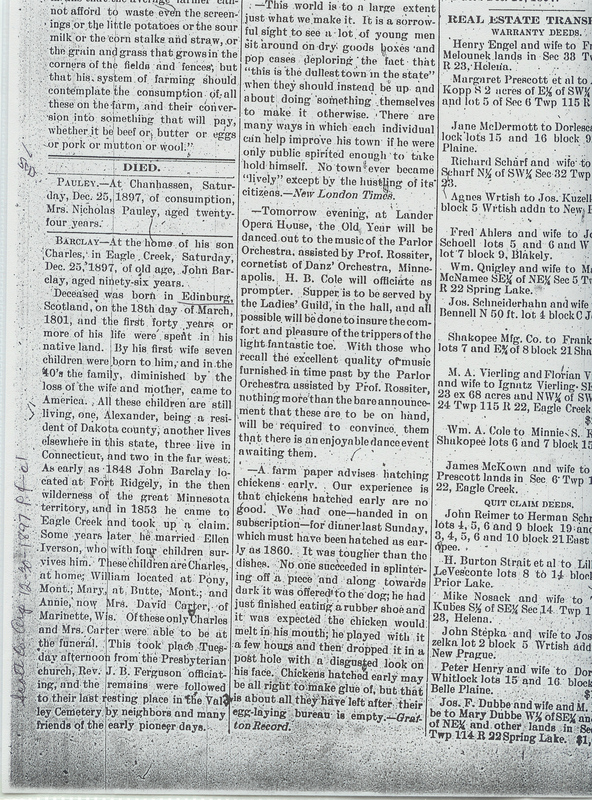 Index: Barclay, John, line 25, Dec. 25, 1897, Book B, pg. 24, line 146. 1897 line 6 Dec. 25, 1897 John Barclay, Male, White, married, 96 years old, born in Scotland, Name of parents John and [Mary], parents birthplace Scotland, cause of death old age, Date of record Jan, 3, 1898. 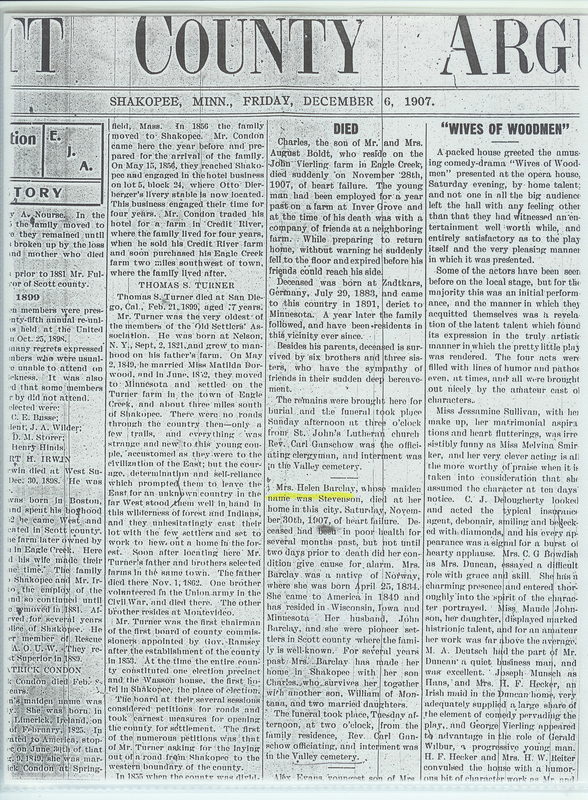 Copies of the register at the Scott Co. Historical Society, June 2007. 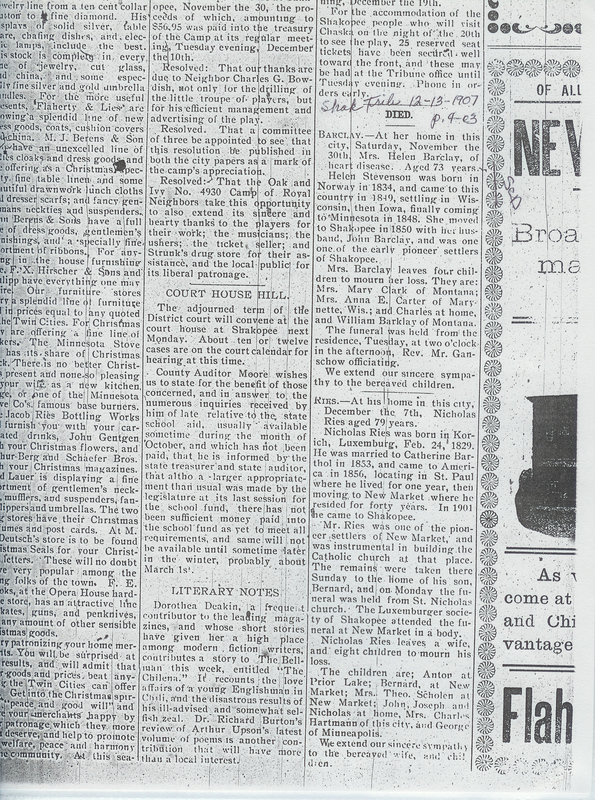 Much to my delight I did find an obituary notice on John in the Scott County Argus newspaper for December 30, 1897 page 4 column 1. George is alluded to but not named like his brother Alexander. BARCLAY – At the home of his son Charles , in Eagle Creek, Saturday, Dec. 25, 1897, of old age, John Barclay, aged ninety-six years. Deceased was born in Edinburgh, Scotland, on the 18th day of March, 1801, and the first forty years or more of his life were spent in his native land. By his first wife seven children were born to him; and in the 40’s the family, diminished by the loss of the wife and mother, came to America. All these children are still living, one, Alexander, being a resident of Dakota county, another lives elsewhere in this state, three live in Connecticut, and two in the far west. 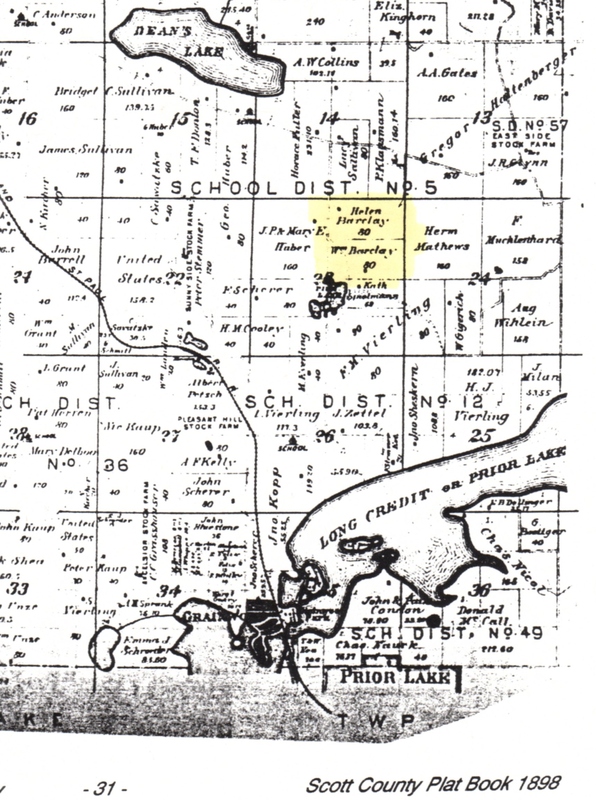 As early as 1848 John Barclay located at Fort Ridgely, in the then wilderness of the great Minnesota territory, and in 1853 he came to Eagle Creek and took up a claim. Some years later he married Ellen Iverson, who with four children survives him. These children are Charles, at home; William located at Pony, Mont. ; Mary, at Butte, Mont. ; and Annie, now Mrs. David Carter, of Marinette, Wis. Of these only Charles and Mrs. Carter were able to be at the funeral. This took place Tuesday afternoon from the Presbyterian church, Rev. J.B. Ferguson officiating, an the remains were followed to their last resting place in the Valley Cemetery by neighbors and may friends of the early pioneer days. 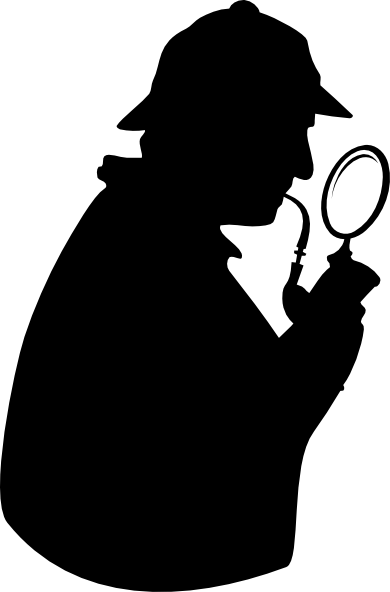 In searching the court Probate records for Scott County, I did not find a will or probate/estate file for John Barclay. I did find one for his wife in 1907. John had sold land to his wife about 1867 and there are deeds in which he sold land to his sons. This means that he probably didn’t have enough money to have a probate; however, there should be a court record of dismissal if that was the case. So I am not sure what happened?